Attached by harness and 11-millimeter climbing rope to her belay partner, 14-year-old Kristina Goetz of Incline Village steps onto a tiny foothold on the vertical wall and climbs. Over the course of the next five minutes—combining the flexibility of a ballerina with a tightrope walker’s balance—Goetz executes a series of moves taking her up the pitch, up and over the overhanging section that caused her problems on this route for so long, all the way to the top of the 32-foot span. Finally free to look back down at her coaches and teammates who’ve been shouting encouragement the whole time, she smiles. 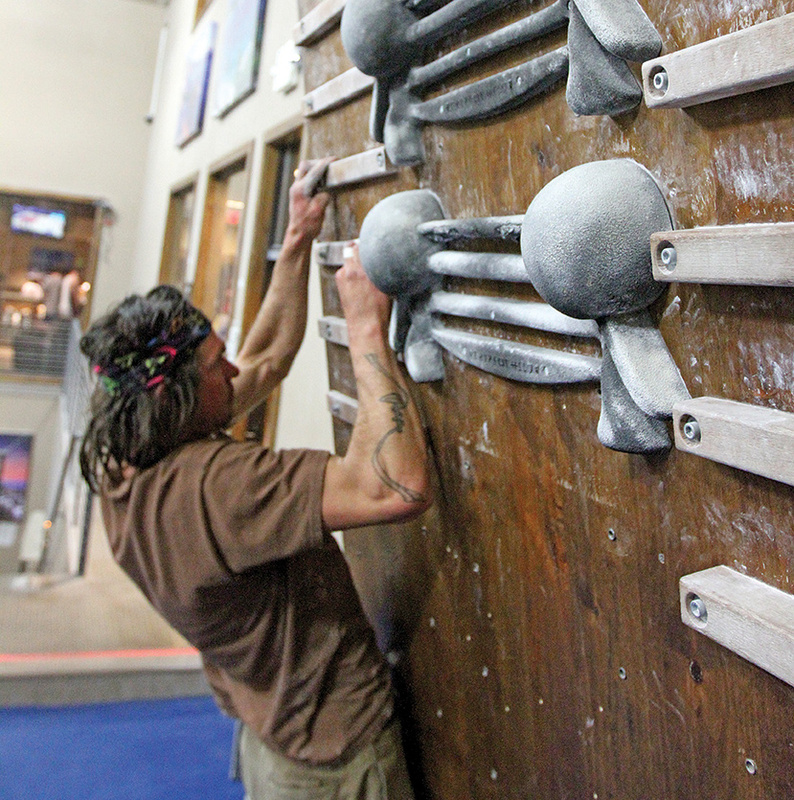 Welcome to High Altitude Fitness—North Lake Tahoe’s only true climbing gym. Tucked amongst the pines in Incline Village, High Altitude Fitness opened in 2006, when owner Jason Burd took over the old Incline Athletic Club. 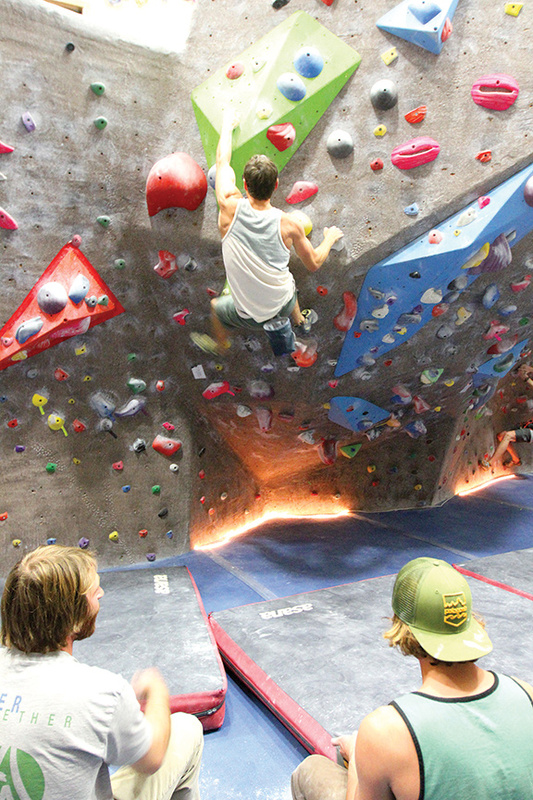 The climbing gym opened in 2008. Walk through the front door and to the left, sights familiar in any gym greet your eyes—men’s and women’s lockers; a room full of treadmills, stationary bikes, elliptical trainers, resistance machines and free weights; and an open space for group classes. But glance to the right, and your eyes are drawn to the brightly lit climbing gym exposed by glass walls like a gigantic fish tank, its sides covered with neon-colored holds bolted onto the artificial rock surfaces that start 15 feet below ground level and rise 32 feet to the ceiling. Inevitably, if your visit falls on a weekday evening, or any day when the weather outside is less than beautiful, you’ll see multitudes of wiry rock climbers—chalk bags dangling, feet squeezed into rubber-coated climbing shoes seeming to defy physics as they stick to the artificial rock—working their way up, over and through some of the 80-plus designated climbing and bouldering routes. If it’s a Thursday, you’re likely to see Goetz training alongside fellow High Altitude Fitness “Team Flash” competitive climbing team athletes. These practices are often led by Dustin Sabo of South Lake Tahoe, Team Flash head coach, who oversees approximately 12 kids training to compete in USA Climbing events around the region, country and potentially the world. Sabo, a climber for 15 years and coach for the past eight, is excited to be teaching in the facility. Watching the Team Flash kids work their way up the wall or cheer on their friends makes the dual nature of the sport quite apparent—looks of intense concentration mask the faces of those on the wall, while below, their friends sit around in loose groups, sharing information (aka “beta”) about their next routes and occasionally shouting encouragement to those above. 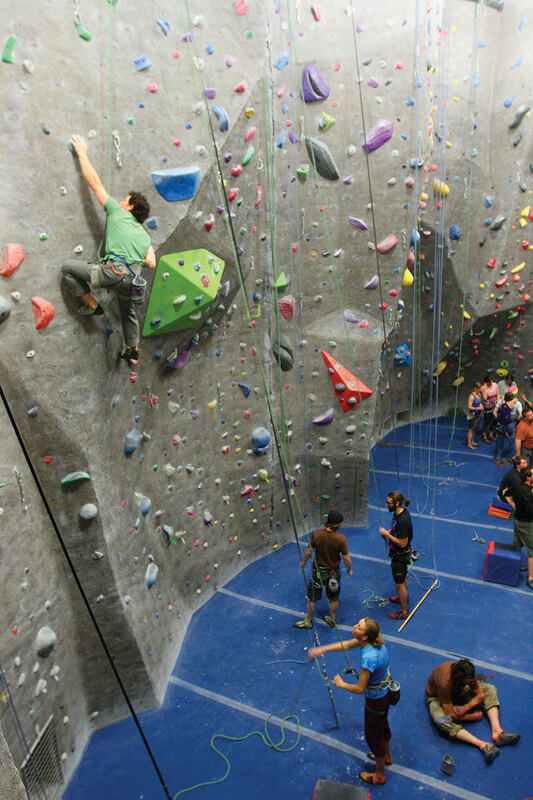 It’s a particularly inclusive vibe, whether you’re an experienced big-wall climber or just learning how to belay someone for the first time in the gym. Jesse Bushey of Tahoe City does pull-ups on a series of tiny horizontal boards drilled into an overhanging wall designed to allow climbers to work on their arm, hand and finger strength. For Bushey, High Altitude Fitness is mostly an off-season destination. With plenty of experience on the granite walls of Donner Summit, Yosemite and the Eastern Sierra, Bushey doesn’t like to compare the gym climbing experience with the outdoors, but he does appreciate what’s possible inside versus out. As Bushey finishes his finger and forearm strengthening routine and heads off to other parts of the gym, Truckee resident and recent Boston-area transplant Tori Heath is hanging upside-down from the overhanging section of the bouldering wall below. Bouldering—rock climbing’s vertically-challenged cousin discipline—typically involves a series of highly technical or intense climbing moves done close enough to the ground that falls are not life-threatening. Instead of ropes and harnesses to protect against injury, crash pads are strewn below the 15-foot-high bouldering wall to make landings easier. Heath, a High Altitude Fitness employee, works her way from a sitting position, up and under an overhanging section where technique, strength and focus all need to be perfectly aligned to hold on. She falls off, but gets back on the “problem” (as bouldering routes are called) almost immediately with some encouragement and advice from a friend nearby. 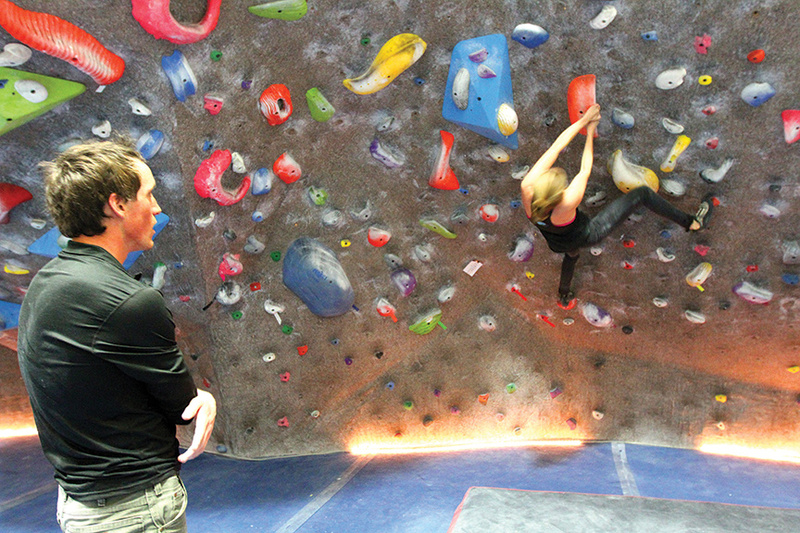 Heath notes the weather-dependent nature of the crowds in High Altitude’s climbing gym—attendance is considerably higher during the winter months or on rainy or windy days. And while she enjoys the community that’s fostered by the gym, she too is looking forward to sampling the legendary Tahoe granite come summertime. That desire aligns perfectly with Burd’s vision for the gym, says general manager Heather Palmer. Paul Raymore is a Truckee-based writer who wishes he was a better rock climber.